Based on the novel by MYSTIC RIVER author Dennis Lehane, GONE BABY GONE marks the directorial debut of actor Ben Affleck. 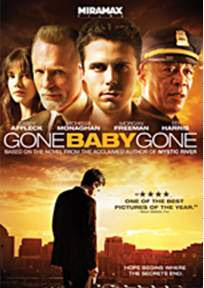 Featuring a solid cast that includes Ed Harris, Morgan Freeman, and Affleck’s brother Casey in the lead role as a private detective, GONE BABY GONE centers on the disappearance of a young girl in the working class neighborhood of Dorchester in South Boston. With plenty of twists and turns, the movie works as a solid crime thriller, but it’s as a study of a place–and one’s ability to either accept and embrace or ultimately break free from it–that the film flowers.